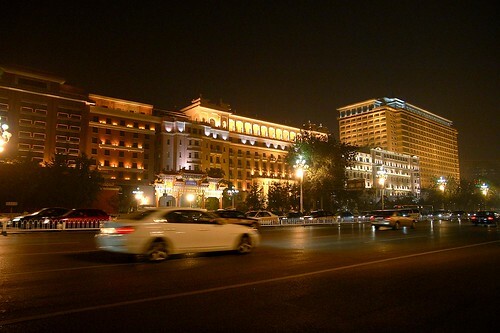 It took us a while to find our hotel because it was tucked away in some obscure back alleyway, even though it IS really close to the Beijing train station and other main areas. 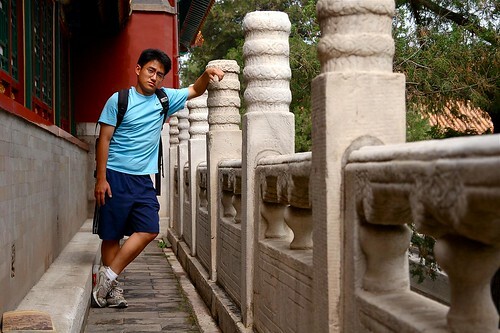 After getting settled into our room, we left for a place called the Summer Palace. 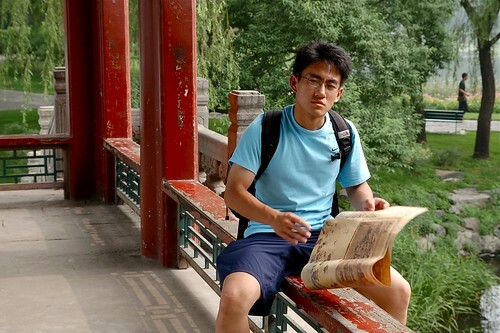 It’s a bit further off in the northwest corner of the Beijing area, the summer vacation destination for the emperors of old. We took the subway and bus. 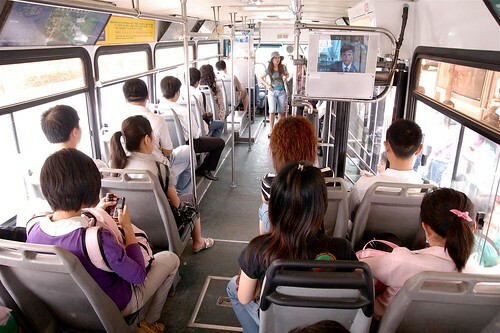 Public transit here is relatively cheap and efficient. Our destination was pretty far from the center of Beijing where our hotel was, but the total trip cost was only about 3-4 rmb (about $0.50). On another note, this place is HUGE (duh you know, but the magnitude of this didn’t really hit me until we were taking the bus around and everywhere we went, the incredible people density just kept continuing even as we moved away from central Beijing). Haha. 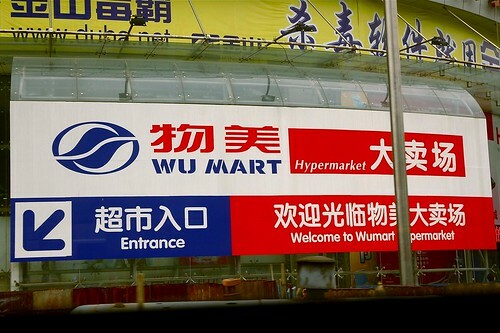 Saw this on the way, your one stop everything shop. 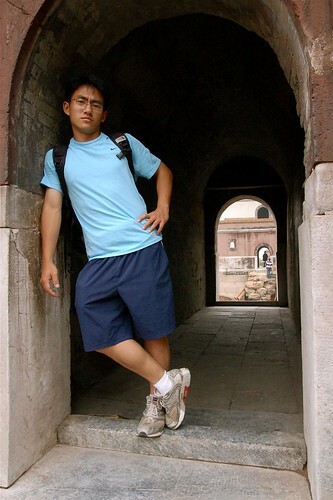 At the Summer Palace. Once we arrived, it was quite obvious why emperors came here: the air felt about 10 degrees cooler, and fresher. The resort grounds are quite large, including a sizeable lake on one side. 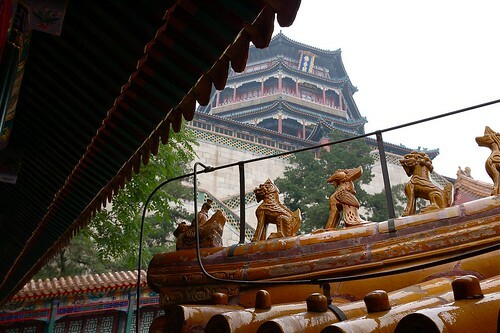 There are many ancient buildings and temples for an afternoon of exploration. Explore we did. Since I’m the cameraman, the following series of photos will feature Johncai, and only Johncai. Hang on to your hats. More “The Adventures of Johncai In China” to come soon. 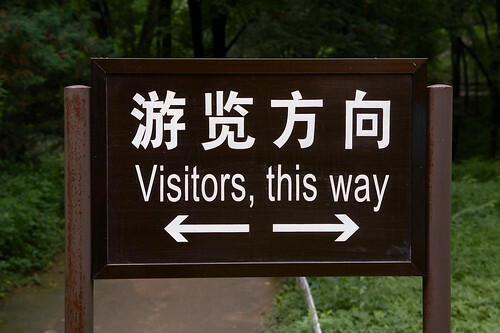 Some signs in China can get quite confusing or hilarious. We saw many, but here’s one example. 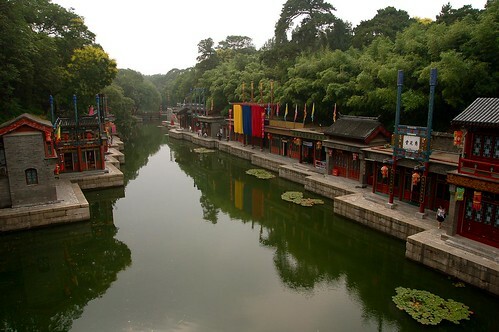 There’s a section of the palace grounds called “Suzhou Street.” I’ve never been to Suzhou, does this look like Suzhou? Pretty cool, it’s like a Chinese Venice. On to day two, of Beijing. People people people. China is home to a lot people. 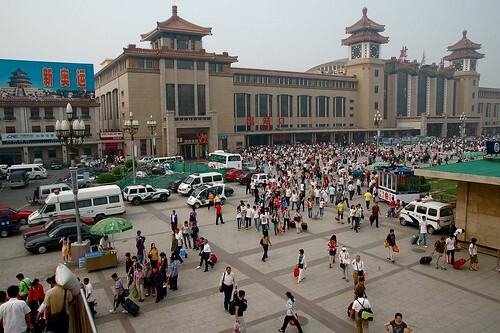 As we headed out in the morning from our hotel, I caught this shot of the Beijing Train Station in the early 8 am rush. There’s nothing unusual about this, crowds of this scale are quite common around the city. DT at Starbucks. 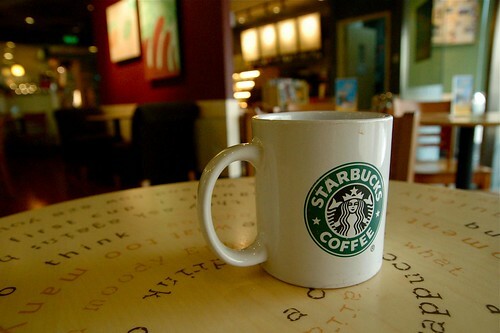 It looks and feels just like an American Starbucks. You pay like you do at an American Starbucks as well, except it even more ridiculous here. This grande size regular black coffee took 18 rmb out of my pocket. That’s about $2.60. However, compare that to our 5 rmb hot breakfast, and you shall quickly realize that NOBODY except foreigners and the rich go to Starbucks. Arrived on an hour long journey by bus to the famous Great Wall. Once we got there, we started a climb. 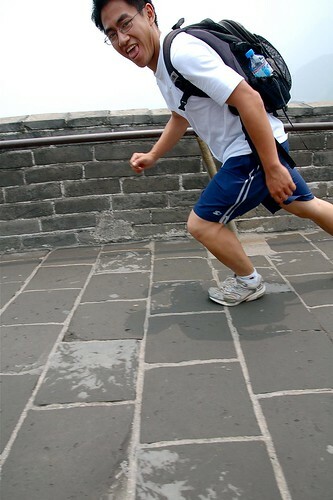 This picture was snapped as we made our way along the wall. 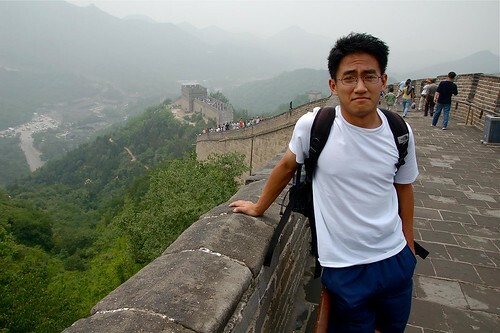 Most of it is pretty steep – something that this picture doesn’t really tell you unless you tilt your head to the left and make Johncai stand up straight. Nice. Here we’re at one of the higher points along this section of the wall. You can see our parking lot far below us at the left edge of the picture. Before leaving, we checked out some of the display artifacts at the foot of the wall. On our way back from the wall, we stopped by the Ming Tombs, where many of the Ming emperors were buried. 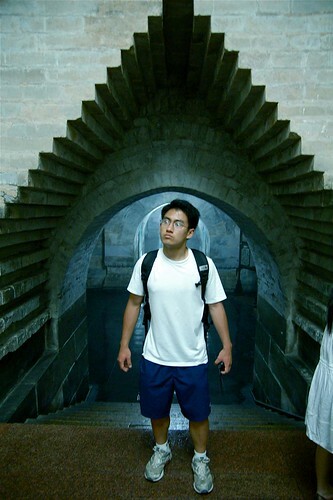 Johncai is not a Ming emperor, but that doesn’t stop him from roaming the catacombs. 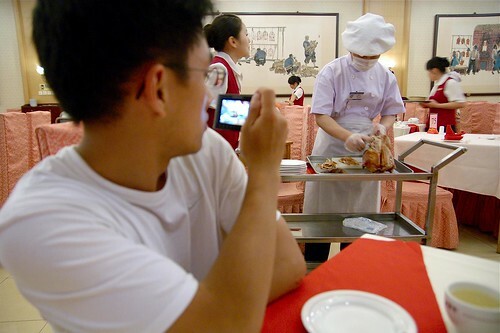 That night, we strolled over to “Quan Ju De,” home of THE original Peking duck dish! Here they are carving the crunchy pieces onto a platter for us. The texture of the duck was quite different compared to any other Peking duck that I’ve had – the fat was clear and had also crystalized into this crunchy delicious form, if that makes any sense. It was real tasty, needless to say. 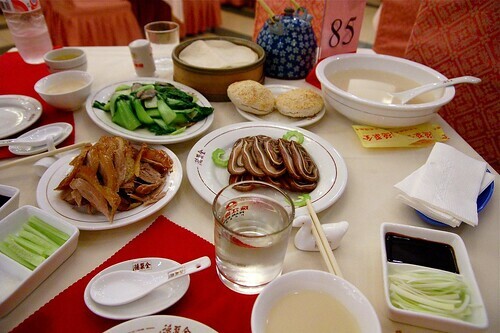 For half a duck with some side dishes and tea, our meal came out to 188 rmb, which is quite expensive by Chinese standards. This experience was well worth it though. A post-dinner night hike around the city. Nice. I’m being watched. Not by the Chinese government, but by Johncai and Liu Xiang, the star hurdler from China that won Olympic gold in Athens 2004. 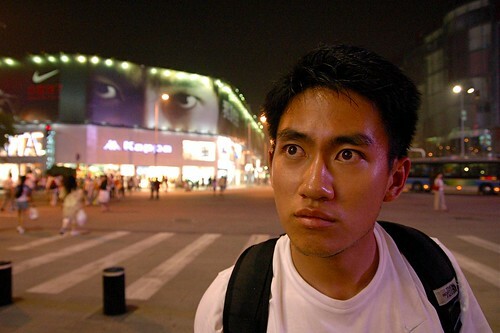 Here he’s watching us on behalf of Nike, such is capitalism in this communist country where nobody believes in communism anymore. Alright, that’s all for now. More updates coming soon, from the Forbidden City and more!